More than 100 Langley parents and youth have shifted the spotlight to support LGBT-friendly education, in the rural-suburban area about an hour southeast of Vancouver. Langley Parents for Inclusivity organized a rally outside their school board on Sept 26, 2017, to back changes recently made to better include LGBT lives — and to show opponents that they don’t speak for everybody here. “The other side of this debate was covered quite heavily,” says founder Stacey Wakelin. “I think that Langley gets a bit of a bad rep — people say we’re in the Bible Belt, we’re not progressive, we’re not inclusive — that sort of thing. I don’t believe that to be true. “I know the Langley with a big heart and I wanted to show people that — especially to the people who say they’re speaking for Langley parents,” Wakelin says. Opponents made headlines in May when they suddenly objected to a note sent home by the school board celebrating diversity and welcoming the changes, which had been in the works since 2014. The opposition surprised the chair of Langley’s school board, who told Xtra that the board stands firm in its commitment to LGBT students. 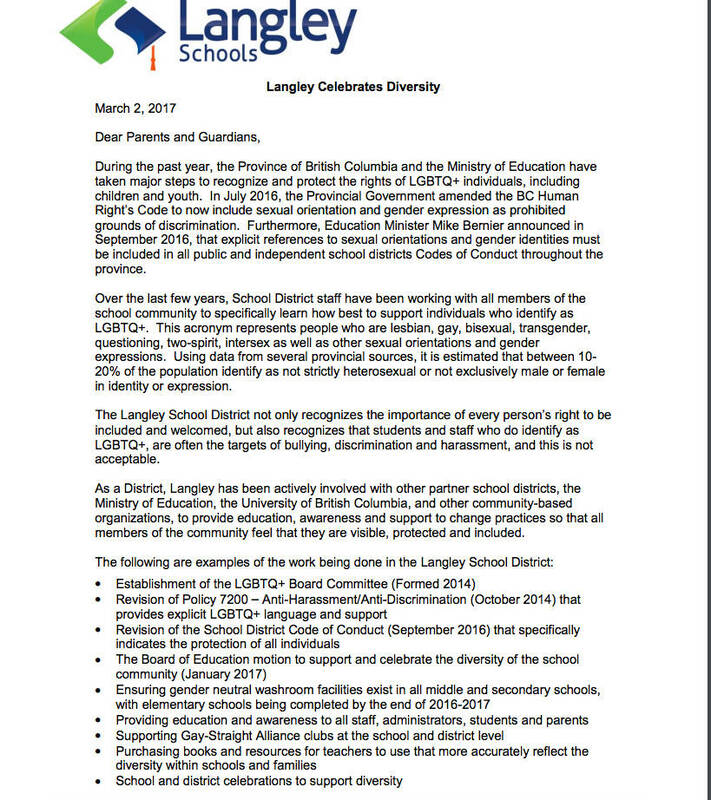 Supported by a conservative group called Culture Guard, the opponents are still challenging the move to make Langley schools more welcoming to LGBT students. Wakelin says it’s time to counter that conservative message. Brad Dirks agrees. He attended the rally with his two sons, one of whom is openly trans, both of whom go to school in the district. “When I started hearing some of the negative, grassroots seeds being planted trying to oppose the SOGI [sexual orientation and gender identity] initiative I felt like I had a responsibility to speak up in support of it, and to make sure that truths are told about it,” Dirks says. “This is going after some of the most vulnerable young people in our community, and in our province, and I just didn’t want to sit back and not do something,” he says. According to Dirks, his son had a “fairly painless transition” in school, but his experience is the exception. “The school was supportive and sensitive to all sides and all concerns, and we basically just hand-held them through the whole thing and brought in professionals where needed, and got everything done over a few years,” he says. Culture Guard president and Langley resident Kari Simpson says at best the changes promote an “anti-heteronormative society,” and at worst she equates the curriculum with child abuse. “To deliberately undermine the ability of a child to determine whether they’re a boy or a girl and create confusion, to manufacture confusion deliberately, is child abuse,” she tells Xtra. Brenda Brown disagrees. She wishes SOGI policies had been in place when her son, who recently graduated, was in school in nearby Abbotsford. Crystal Weller hopes her daughters won’t experience that sort of anguish when they start school. She and her wife say it’s important to show their support for SOGI now. “We’re a diverse family, and the last thing we want is for our children to go to school and to feel different and be bullied or unaccepted,” Weller says. Robert McFarlane, chair of the Langley school board, says he’s still surprised by recent opposition to the program, but is impressed with the parents who are speaking out in support of it. “It’s always good when people have a commitment to supporting education in the way that they think is right. We all have a tendency to speak out only when we don’t like what’s going on,” he says, adding that SOGI is not up for debate.